Multilingual text processing is useful because the information content found in different languages is complementary, both regarding facts and opinions. While Information Extraction and other text mining software can, in principle, be developed for many languages, most text analysis tools have only been applied to small sets of languages because the development effort per language is large. Self-training tools obviously alleviate the problem, but even the effort of providing training data and of manually tuning the results is usually considerable. 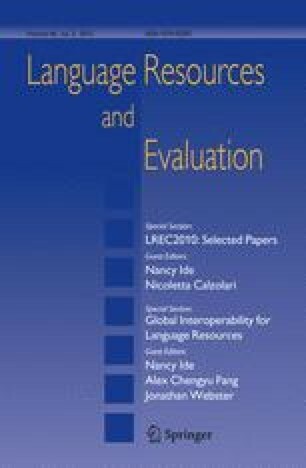 In this paper, we gather insights by various multilingual system developers on how to minimise the effort of developing natural language processing applications for many languages. We also explain the main guidelines underlying our own effort to develop complex text mining software for tens of languages. While these guidelines—most of all: extreme simplicity—can be very restrictive and limiting, we believe to have shown the feasibility of the approach through the development of the Europe Media Monitor (EMM) family of applications (http://emm.newsbrief.eu/overview.html). EMM is a set of complex media monitoring tools that process and analyse up to 100,000 online news articles per day in between twenty and fifty languages. We will also touch upon the kind of language resources that would make it easier for all to develop highly multilingual text mining applications. We will argue that—to achieve this—the most needed resources would be freely available, simple, parallel and uniform multilingual dictionaries, corpora and software tools. I would like to thank the following persons for having shared their own multilingual grammar writing experience with us, or their views on linguistic resources: Kalina Bontcheva (Sheffield University) on GATE; Frédérique Segond, Caroline Hagège and Claude Roux (Xerox Research Centre Europe) on the Xerox Incremental Parser; Aarne Ranta (Gothenburg University) on the Grammatical Framework; Jacques Vergne (Caen University) on sentence chunking using extremely light-weight methods; Eric Wehrli (Geneva University) on his deep-linguistic parser; Gregory Grefenstette (Exalead) and Gregor Thurmair (Linguatec) on their respective multilingual products; Khalid Choukri (ELRA/ELDA) and Gregory Grefenstette on linguistic resources; and my JRC colleagues Maud Ehrmann, Hristo Tanev, Vanni Zavarella and Marco Turchi for sharing their experiences and for their feedback on earlier versions of the paper. The ultimate responsibility for any errors, however, lies with me. I would furthermore like to thank my superiors Erik van der Goot and Delilah Al Khudhairy for their support, and my colleagues in the OPTIMA group at the JRC for the fruitful and efficient collaboration over the past years, and for so reliably providing large amounts of clean multilingual news data, which allowed us to run many multilingual experiments. Building the complex EMM applications was a successful team effort that also includes many less rewarding and less visible tasks. My specific thanks go to my former colleague Bruno Pouliquen (now at WIPO in Geneva). We developed most ideas together, and he very efficiently implemented many ideas and integrated the many tools with each other.